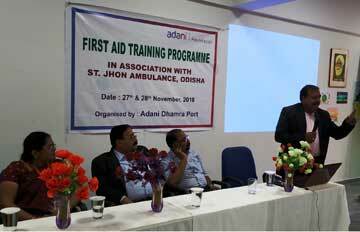 Dhamra: Adani Foundation in association with St. Jhon Ambulance organised two day long first aid training programme on primary health care. The programme was organised at the premises of Adani DAV Public School under Karanpalli GP from 27th Nov to 28th Nov. Attending as the chief guest, Shri Sangram Kumar Sahu District Education Officer, Bhadrak inaugurated the programme. Two skilled trainers Shri P K Mohapatra and Shri A K Mohanty from St. Jhon Ambulance delivered training about 35 teachers from 35 schools from Dhamra periphery. CSR Head of Adani Foundation Shri Subash Ray, headmistress of Adani DAV Public School Smt. Krushnapriya Sarangi and other port officials were also present during this two day long workshop.